What is a Toga, and Who Wears It? 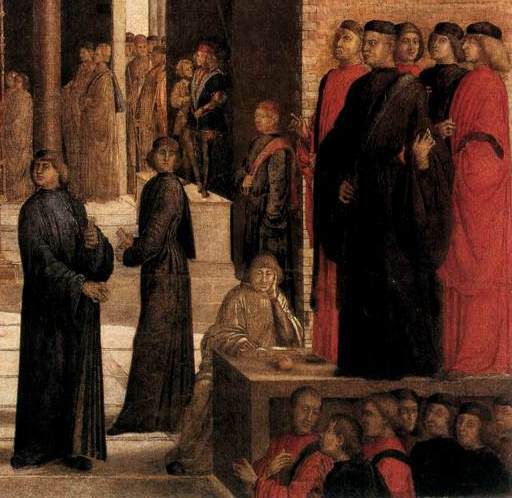 At the end of the fifteenth century, the Venetian toga was still, in its general style, the long gown already the traditional uniform of well-placed Italians when Dante himself wore one. As Sanudo explains, it reached the ankle...and fastened at the throat with a very small and unobtrusive tie. While we can identify in countless paintings the object described by Sanudo, the terminology is slightly more difficult to understand, for the Venetian toga was unlike the traditional Roman garb: it had sleeves. For the long, closed gown the word toga was correct but very rarely used; it was usually called a vesta, the term also used in referring to the long outer dress of women. 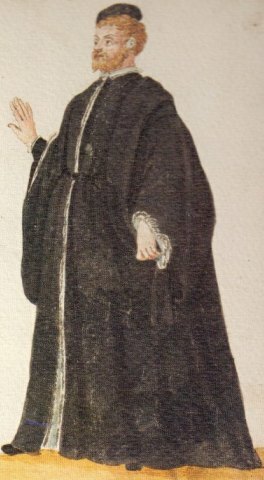 A vesta was worn by virtually every member of the Venetian Republic entitled to wear official dress – the doge, the Procurator, the patrician, the doctor and those citizens admitted to the Council. At around age twenty-five, Venetians citizens of the governing class abandoned the fancy clothes of their youth, "were recorded in an official register as togati, and from that time until their deaths they continued to wear a vesta of the approved pattern." 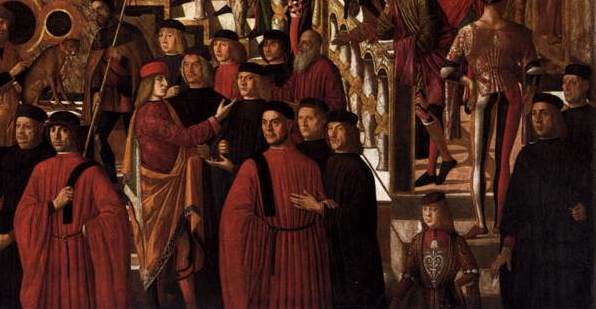 The style is not unique to Venice, but the way it was worn constantly as a prescribed uniform was. 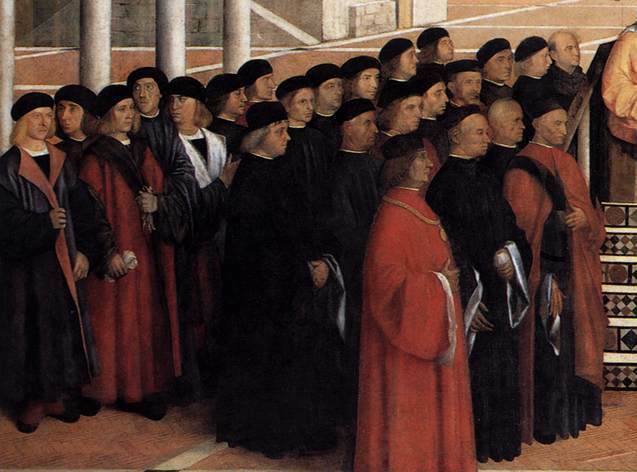 Members of the Venetian government do not seem to wear any further cover or mantle over the vesta. There were two shapes of sleeves on the toga, and "it was the type of sleeve that the Venetian wore set into what he pleased, on occasion, to call his toga that placed him most immediately in the social hierarchy." Newton describes both styles as subdued remnants of International Gothic fashion. 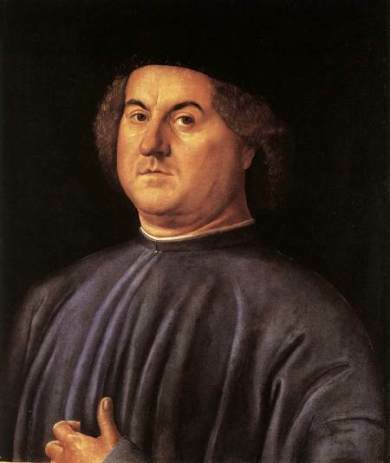 The higher ranking style, "those which hung like great bells with their ends open at the wrist" were called a dogale, in honor of the leader of Venice, the doge. Although sometimes the governing body would issue statements condemning the improper use of this style by low-ranking persons, "wide sleeves were in fact perfectly acceptable if they were worn by the truly prosperous and not usurped by those who were not. They were allowed to Procurators, to doctors of medicine, to victorious generals on their return, to the chief representative of the government in the dependent cities – Podeste – and to other favored employees of the Republic when they had successes to report." Patricians with a dogale sleeves turned back slightly to reveal light colored (fur?) linings. The other style was also wide, but "gathered up at the wrist so that they hung, not like bells but like bags.... It was these last which were likened to a bird's crop and named a gomito, modified regionally in Italy to a comedo or a comeo; the two terms were interchangeable in Venice." 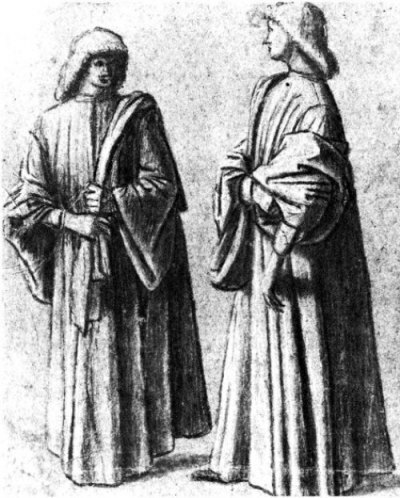 A late fifteenth century traveler from Cologne recorded his observations about Venice, including "their handsome long gowns worn to the feet, 'the sleeves of the gown,' he says, 'are narrow at the hand, but behind they hang down about an ell wide, like a sack, just as we make clothes for jesters in our country." It is this second style, the less ostentatious one, that I wish to recreate for my husband. 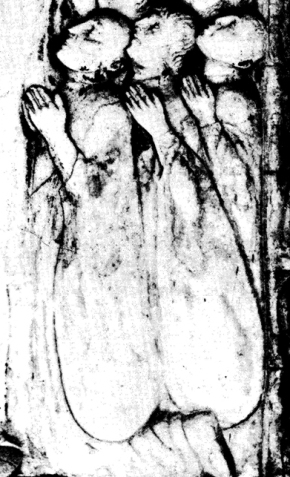 The sculpture of guild members (left image) praying to the Virgin shows clearly the fitted wrist and bag-shaped a comeo style sleeves. 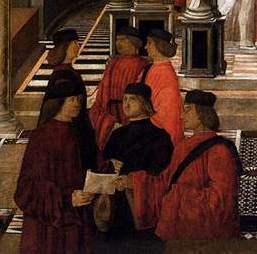 The young patricians (right image) also have a comeo sleeves, but they have pushed the tight part up to their elbows, displaying the cuff of the zupon underneath and causing the sleeves to look much like the a dogale style. There are three or four acceptable colors for the toga, many different fabrics with varying degrees of rank, and different linings that varied with the seasons. The regulation black cloth, correct for everyday wear in and about the city, was suitable for only the most routine official occasions; for anything even mildly exceptional it could be criticized as being inadequate. This black cloth was named in Venice zambellotto and imported in large quantities from the Near East. The word was a corruption of the French camelot and the English camlet, both of them originally implying a stuff made from camel-hair but lately merely a commonplace woolen cloth. There were four distinct gowns divided into four seasonal categories according to the materials of their linings: thick fur of marten, sheared lamb, fuine or wolf for winter, then successively squirrel-back (dossi), miniver, and a thin silk for summer. This meant that a togato would have in his wardrobe at any one time at least four suits of statutory black cloth. I made a toga from black wool because this was both affordable to me as a modern person and appropriate to my husband's persona's rank. I lined it with silk, as if it were for summer use only, because that is a material I can reasonably acquire. Because dogale sleeves "would never normally be worn with gowns made of wool." I made the sleeves fitted at the wrist, or a comeo. If I were to attempt a highly formal gown for my husband, I could aim for the highest ranking fabric, cloth of gold, or slightly less pretentious velvets (ones with woven designs would be of higher value) and damasks. I could also use heavy silks with a satin finish or a poplin weave. No matter which fabric I choose, I must be very careful about the color, and must be sure that the color is appropriate to the fabric. The colours allowed were more limited than the permitted fabrics. White could, as in church vestments, stand as equal to gold for the robes of the doge... Second in importance to gold (and white) and far more usual was the deep crimson tint referred to a cremesino and dyed with kermes, a dye made from minute insects imported mainly from India. Cremesino was never used as a dye for cloth but it was the correct dye for official gowns of velvet, damask, or plain silk. For crimson official gowns in any of these stuffs dyers were, by their statutes, forbidden to use anything but pure cremesino in this period.... Following the heavy silk fabrics down the scale of materials came scarlatto, a term derived originally from two Netherlandish words denoting an especially fine heavy cloth. Because this had usually been dyed to a bright red it had come, by the end of the fifteenth century, to refer to the colour rather than to the type of cloth. Indeed it seems that by that time it could be used, though it only very occasionally was, to describe the colour of a silk fabric.... Apart from gold, crimson and scarlet, black velvet or damask gowns were sometimes worn and not invariably as a sign of mourning but some important reservations existed over the use of black, however expensive the stuff. But there was also another official colour, one which has been a matter of dispute: paonazzo or pavonazzo. Newton spends many pages exploring the political and social meanings of the mysterious and undefined color paonazzo, but I am unlikely to ever attempt to make a garment from this color, no matter what it might be. 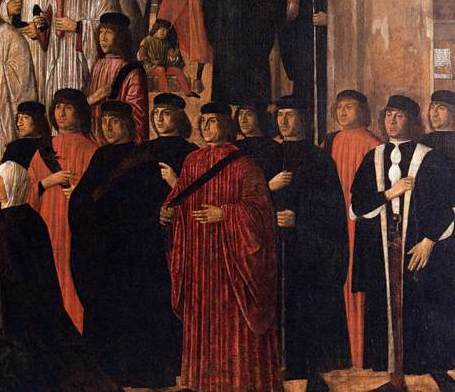 The members of the Scuola di San Giovanni Evangelista, which commissioned the Miracle of the True Cross series, are featured as part of the observing crowds throughout the paintings in the series. Venetian patricians also look on in the Saint Ursula series and the Sermon of St Mark in Alexandria. I have made comments below each image about features I see in the paintings. These comments are weighted unfairly toward those patricians dressed in red, as the details of their clothing are so much more visible than the details of those dressed in black. The third togato from the left has the lower front edges of his toga turned back, displaying a lighter colored fur lining. Multiple men have on black belts with metallic decorations; on some, you can see that the belt hangs down in front. 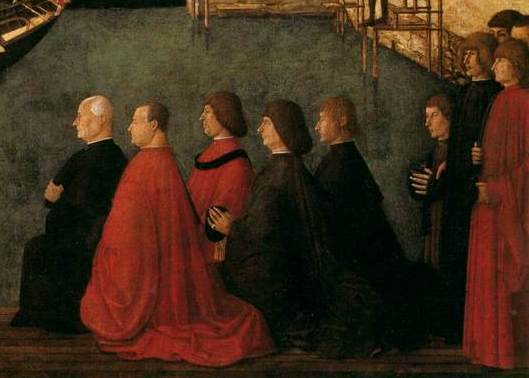 The gentlemen with red gowns in front (are they cremesino or scarlotto? I cannot tell) both have black belts. The one in the center foreground wears his becho on his left shoulder instead of his right, as most do. The one on the right has his a comeo toga sleeve pulled up to his elbow so that the black sleeve of his zupon peeks out at the wrist. 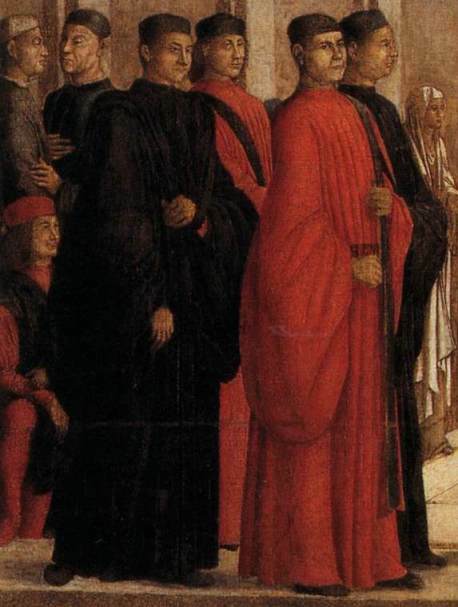 The sleeves on the figure in black, second from left, seem unusually narrow, especially when contrasted to the red sleeves on the far right. At least some of the figures appear belted. Here there are clearly different red fabrics. Due to the play of light on the folds, I would guess that the central figure is wearing velvet. Despite their red vesti, they all have the basic black bechi and black barreta. It appears as if the togati are not wearing belts in this scene. The man in front on the right side is not wearing a toga, but the mantle of a patrician youth. Here again I see different colors of red, different fabrics for the gowns. One man, toward the back, has a black belt over a red gown, but the others obscure their waists with their arms. These togati clearly lack belts. The sleeves look enormous and the gowns are obviously quite full. The left image shows a man with an unbelted toga who has lifted the front with his arm. The black sleeve seen at his wrist is the zupon he wears underneath, with large puffs of shirt showing. 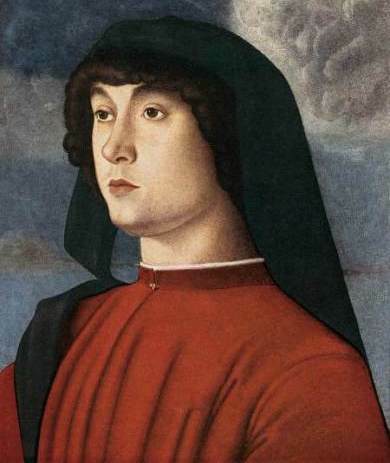 His gown sleeve seems much less full than the sleeve of the gentleman in red in the right image; perhaps his is cut a dogaline - a small bell-shaped sleeve. The man on the far right seems to have a dark colored belt, and the lines of his toga appear to lay in nearly perfect folds. His becho is unusually long. While I was sharing these images, a friend proposed that the regular folds of the toga were maintained by stitching to tapes inside the gowns, as one can see a few inches from the edge of this unfortunate man's mantle (above). I doubt this theory, as several very detailed portraits (below) show folds that are neat but not regular or symmetric. I believe that the perfect lines down the front of vesti in some of the group paintings above were an artistic license meant to render the featured patricians in their best imagined form. Some of the most detailed images I have found of togati are from 1575. These are images from travel albums (below) are locally painted and not produced by master artists. 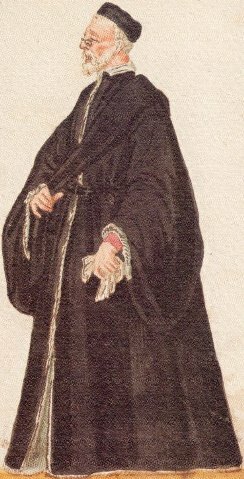 The basic form seems much the same as in 1500, but some of the details, such as the fashion for beards, and perhaps the shape of the collar and the exact cut of the sleeve, may differ from the gowns of earlier generations. This garment, unlike the others described in this site, is not entirely my own work. About a decade ago, back when I urged my husband to make his own SCA clothing, back before I decided that I really enjoyed sewing clothes, he made this toga. He made it with very square-cut a dogale sleeves set in with a gusset, and with two different mismatched weights of black fabric because that was what he had on hand. The collar was floppy and looked all wrong, the hem was irregular and usually too high, there was no lining, and the entire garment was machine sewn. A couple months ago I took pity on him and removed the collar, replacing it with a hand-sewn standing collar. I had to piece the one tiny scrap of gown fabric I could find in our wool stash. To pattern the collar, I traced a modern band collar shirt of my husband's. I believe, based on my more recent deep perusal of period portraits, that the collar should become slightly wider over the shoulder than it actually does. I also made him a better closure: two eyelets and a black silk fingerloop braided cord. After I committed to entering the St. Catherine's A&S Tourney, I re-read so many sources, looked at so many images, and learned so much that I decided his toga needed a complete makeover. Just days before submitting the documentation, I found a way to get my hands on a copy of a sixteenth-century Milanese Tailor's book (many of the books I wanted were denied me through interlibrary loan due to their great cost. But I have friends with University library access!) only to discover that the most relevant images were already scanned and available online. 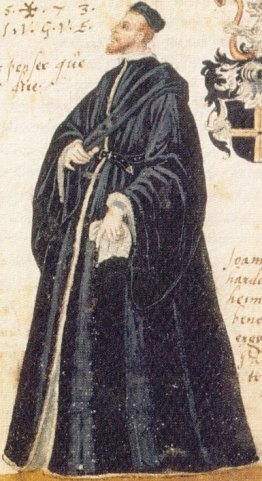 While the robes diagrammed there are not Venetian nor from 1500, they are clearly quite similar and are an excellent starting place for cutting at least the body of the vesta. Based on the look of the gowns, I suspect that I need to copy the body, but not the sleeve, of the doctor's robes (right), which have wide, full backs, deep-cut armscyes in front, and a shallow curve cut for the arm in the back. Other panels and paintings of doctors are strikingly similar (figure 88 right) so I doubt that this is an unusual style. 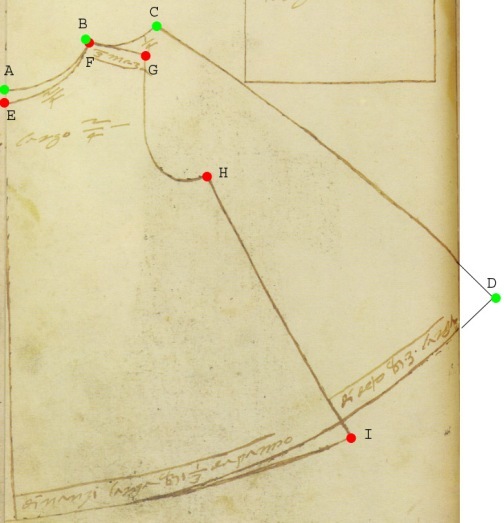 Although I cannot completely figure out this diagram, here are my observations and interpretations: The smaller panel (red dots) is the front, the larger (green dots) is the back. The back panel, of which two should be cut, seems to be about half again as wide as the front panel. F to I should equal the body measurement from shoulder to ankle. GH is the front of the armscye, and BC is the back of the armscye. FG is the front shoulder seam. My questions are these: Where are the shoulders sewn together? Does FG sew to AB or some part thereof? Is there one continuous curve along the back for both the neck and the shoulder seam? That is what I see, but it doesn't make sense to me. Even more perplexingly, why do the side seams (HI in front and CD in back) not match in length at all? Does GI sew to CD, with no shaping at all on the back of the armscye? That does not match any pattern that I know, in part because straight lines down the back don't make for a comfortable sleeve. Because I am working with an existing, partially-sewn toga, even if I could figure out the Tailor's Book, I could not recreate its patterns. What I have now has equal front and back panels. The closest thing I can find in my books is the woman's loose gown or frock in the Tudor Tailor, so I cut the armscyes and sleeve heads to match this pattern. After submitting this documentation, I will finally have some time to sew and create some of the things that are in my head. I need to cut the body of the toga to provide more shaping in the arm region, and to pattern and sew a large a comeo sleeves. Then the entire body of the toga needs to be lined with black silk. 1. Stella Mary Newton, The Dress of the Venetians, 1495-1525 (Aldershot, England: Scolar Press, 1988), 9. 15. Maurizio Rippa Bonati and Valeria Finucci, eds., Mores Italiae: costumi e scene di vita del Rinascimento = Costume and Life in the Renaissance: Yale University, Beinecke Library, MS 457 (Cittadella, Padova: Biblos, 2007), 74. 16. Bonati, fig. 73, left. 17. Ninya Mikhaila and Jane Malcolm-Davies, The Tudor Tailor: Reconstructing Sixteen-Century Dress (Singapore: B T Batsford, 2006), 71-74.